Thanks for having me, Katie! As usual, I enjoyed your company and doing this project with you. I guess you’d say it was payback for punching out thousands of flowers from construction paper for me for my wedding six years ago*. So thank you and you're welcome. *Editor's note: Christie got married in '03 and had lots of fun DIY projects...including asking some of her younger cousins to punch out paper for confetti so it would match her wedding colors :-). Katie had a pretty good idea what she was looking for in an invitation; the colors were chosen, the outer shell had been found and the verbiage was written. Now it was time to put that all together. 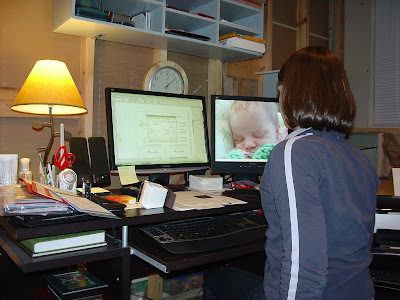 I had Katie sit down and search through www.istockphoto.com to find the right illustration to accompany her vision. She was on the fence with a branch, a tree or a leaf, something natural anyway. Well, she stood by her blog title “The Indecisive Bride” . 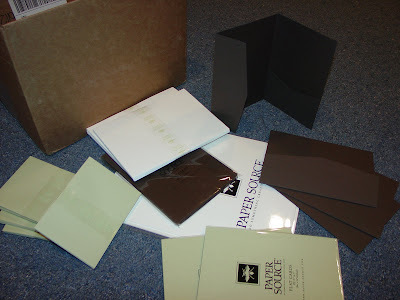 the paper supplies from paper source and paper and more. The cards on the right were filled with reply information, directions, a map and accommodations. We utilized the other images on each of these cards, keeping with the natural feel but not overshadowing the over dandelion look. She had already supplied me with the information, so we just had to organize it. Each card was sized to fit ¾” above the over, so that all the titles could be seen at a glance. (In some cases, I’d create all the sizes around the reply card as it may be a postcard with postal regulations or to fit in a supplied envelope. For Katie, she chose to use her wedding website, an joint email address and a phone number – a more contemporary approach to reply cards, i.e. a way to go green). 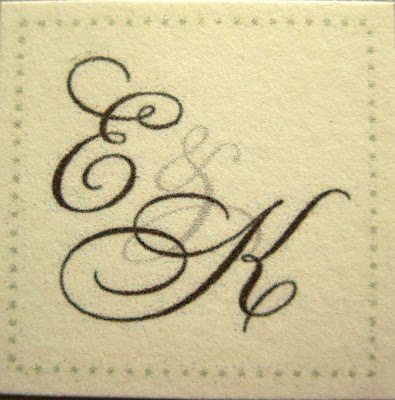 To finish off the invite, I set up small monogram squares featuring their initials. Katie printed, cut and assembled them with double sided foam tape to give the pocket fold a good seal. An elegant finish to a beautiful invite! the monogram that I forgot to photograph actually sealing the invitations! coming soon. Being a graphic designer, I work on more advanced programs like Photoshop and Corel Draw. These programs allow me to manipulate illustrations and images to create the visual needed. I’m known around my peers for being a fontaholic and sometimes ask people to not watch me scroll through fonts – it gets a little dizzy! I like a clean sans serif font combined with an elegant, but legible script font on most invitations. It provides sophistication but a modern edge. I used the same 2 fonts throughout Katie’s invitation. I recommend only using 2 fonts asit can get too busy. If you want, change it up by using the same font in all caps or in all lower case. This shows more cohesion than throwing a bunch of cute fonts together. I’ll let Katie take it from here (part two coming next week!) I really enjoyed this project, as it’s a design that I’d do for myself and love the end product. It was also awesome to have Katie stay with us for the weekend and spend time with her 2nd cousins. If you have any questions about wedding invitations or are interested in having me work with you on designing yours, please email me at Christie@paperandinkdesigns.com.